So, you may be wondering, how does one deal with the fact that they were supposed to be having a garage sale this past weekend but had to postpone because they were not ready? Well, I'll tell you. They get out of dodge! This weekend, we took a short day trip a couple hours from here to visit a really cool aquarium. Since we are not going to be able to take a "Family Vacation" this summer, we really wanted to get away and do something, anything. You know? The boys had a complete blast. 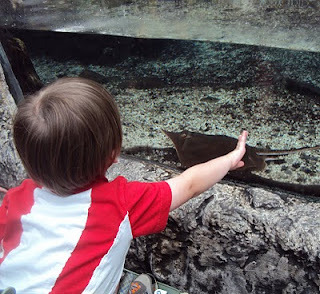 #1 was really jazzed at times but anytime there was really big animals or touch tanks, he respectfully kept his distance. 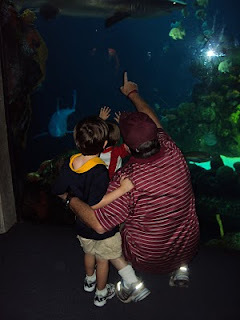 #2, on the other hand, Mr. No Fear, it was all we could do to keep him in his stroller and not jumping in the tanks. So funny how different their personalities are! I love this pic of Husband pointing out things to the boys. 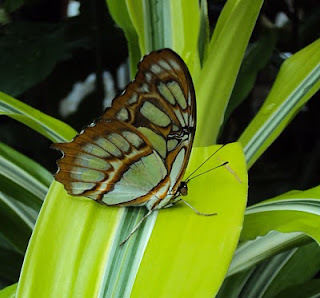 There was a really cool butterfly garden in one of the buildings. I really like butterflies, buuuuut.....if one of them lands on me, well, that's a different story. Because they are still bugs and they feel like a bug on your skin. (Sorry.) 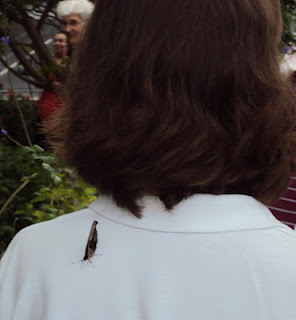 Apparently one of them really liked my white shirt, and kept trying to hitch a ride out. I didn't know this one was on me until some guy came up to me and said..."Gimme your camera. Stand still. Stand still." (uuuuuhhhh.) Then he said there was one on my back. It's a good thing I didn't feel it. I actually didn't freak out, aren't you proud of me??? I am!!! Also? I got a new case for my other half ::cough:: iPhone. She's a beast and pretty much unbreakable and waterproof (all things I need) and was not cheap, and I had to go to like 5 stores to find one, because NONE OF THE FREAKING EMPLOYEES IN ANY OF THE STORES WOULD HELP ME FIND ANY, AT&T!!! but anyway, I finally have it and I am sooooo happy. I also love it because it matches my armband thingy for my ipod I use when I run, which looks like this... yes, it matters!! And I just love black and pink together. So, now, fun's over. I will be spending every night in the sweatshop known as my garage. And hopefully next week I will have some more kitchen cabinets.